I was very pleased, on checking my email this morning, to see that my and Matt’s new paper, The neck of Barosaurus was not only longer but also wider than those of Diplodocus and other diplodocines, is now up as a PeerJ preprint! Taylor and Wedel (2013b: figure 6). Barosaurus lentus holotype YPM 429, Vertebra Q (C?13). Top row: left ventrolateral view. Middle row, from left to right: anterior view, with ventral to the right; ventral view; posterior view, with ventral to the left. Bottom row: right lateral view, inverted. 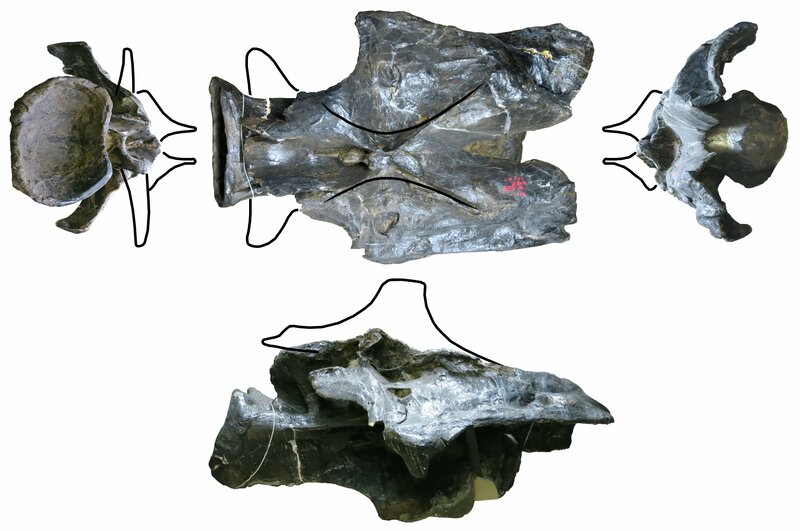 Inset shows diapophyseal facet on right side of vertebra, indicating that the cervical ribs were unfused in this individual despite its great size. Note the broad, flat prezygapophyseal facet visible in anterior view. Thank you for submitting your manuscript, “The neck of Barosaurus was not only longer but also wider than those of Diplodocus and other diplodocines” (#2013:09:838:0:0:CHECK:P) – it has now been received by PeerJ PrePrints. Next, it will be checked by PeerJ staff, who will notify you if any alterations are required to the manuscript or accompanying files. If the PrePrint successfully passes these checks, it will be made public. You will receive notification by email at each stage of this process; you can also check the status of your manuscript at any time. Lots to like here: the quickness of the response, the promise of automatic email updates, and the one-click link to check on progress (as opposed to the usual maze of Manuscript Central options to navigate). Sure enough, a couple of hours later the next automatic email arrived, telling me that Matt had accepted PeerJ’s email invitation to be recognised as the co-author of the submission. And one hour ago, just as I was crawling out of bed, I got the notification that the preprint is up. That simple. Taylor and Wedel (2013b: Figure 9). Partial reconstruction of the Barosaurus lentus holotype YPM 429, cervical vertebra R, approximating its undamaged state by allowing for dorsoventral crushing, shearing and loss of some extremities. Anterior and posterior views scaled to 125% of uncorrected width and 80% of uncorrected height. Dorsal view scaled to 80% of uncorrected height; condyle moved forward and cotyle scaled to 50% of uncorrected width to allow for shearing. Lateral view scaled to 125% of uncorrected height, and sheared backwards 15 degrees. 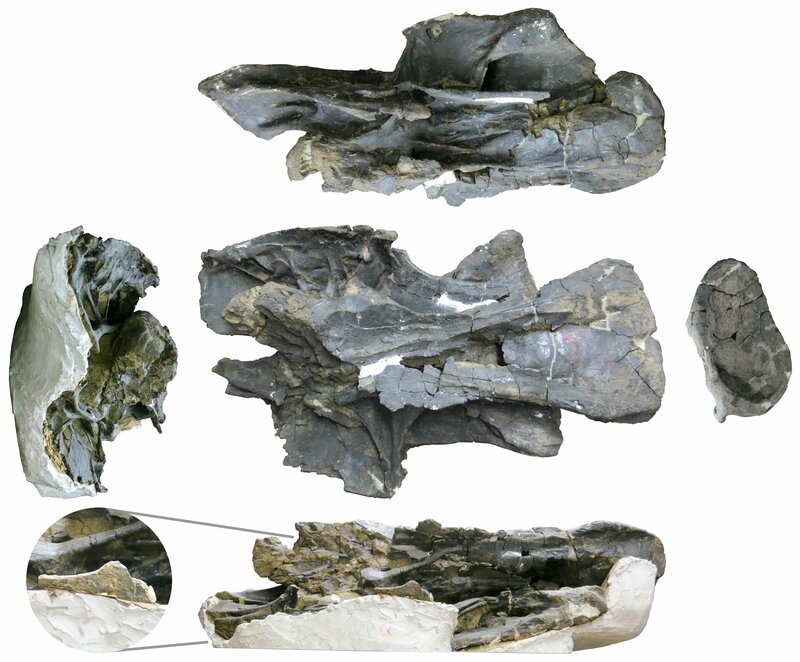 Metapophyses and postzygapophyses drawn in multiple views based on vertebrae Q and S and AMNH 6341 material. I’m also pleased because we managed to get this baby written so quickly. It started life as our talk at SVPCA in Edinburgh (Taylor and Wedel 2013a), which we delivered 25 days ago having put it together mostly in a few days running up to the conference — so it’s zero to sixty in less than a month. Every year we promise ourselves that we’ll write up our talks, and we never seem to get around to it, but this year I started writing on the train back from Edinburgh. By the time I got home I had enough of a hunk of text to keep me working on it, and so we were able to push through in what, for us, is record time. We want this paper’s time as a preprint to be time well spent — which means that we want to improve it. To do that, we need your reviews. Assuming we get some useful comments, we plan to release an updated version pretty soon; and after some number of iterations, we’ll submit the resulting paper as a full-fledged PeerJ paper. So if you know anything about sauropods, about vertebra, about deformation, about ecology, or even about grammar or punctuation, please do us a favour: read the preprint, then get over to its PeerJ page and leave your feedback. You’ll be helping us to improve the scientific record. We’ll acknowledge substantial comments in the final paper, but even the pickiest comments are appreciated. Because we want to encourage this approach to bringing papers to publication, we’d ask you please do not post comments about the paper here on SV-POW!. Please post them on the PeerJ preprint page. We’ve leaving comments here open for discussion of the preprinting processes, but not the scientific content. Taylor, Michael P., and Mathew J. Wedel. 2013a. Barosaurus revisited: the concept of Barosaurus (Dinosauria: Sauropoda) is based on erroneously referred specimens. (Talk given as: Barosaurus revisited: the concept of Barosaurus (Dinosauria: Sauropoda) is not based on erroneously referred specimens.) pp. 37-38 in Stig Walsh, Nick Fraser, Stephen Brusatte, Jeff Liston and Vicen Carrió (eds. ), Programme and Abstracts, 61st Symposium on Vertebrae Palaeontology and Comparative Anatomy, Edinburgh, UK, 27th-30th August 2013. 33 pp.